Former Liverpool goalkeeper Jerzy Dudek showed his class this afternoon when he stopped Liverpool’s legends match with AC Milan to play with a disabled fan. In a game that was full of excitement, arguably the best moment of the match came from Dudek. 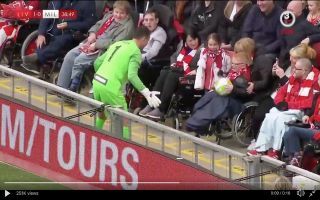 The Polish stopper went behind the goal to collect the ball, but instead of returning straight back to the pitch the 45-year-old played with a young disabled fan and gave him an experience that he’ll never forget. It’s great to see moments like this in football. Jerzy Dudek stopping the #LFC legends match to play with a disabled fan ? Massive respect to Dudek for doing this, he’s a credit himself and Liverpool.